According to the mission statement, the goal of our working group was ‘to engage, involve and inform all stakeholders about the transformative elements of citizen science projects.’ While the meetings we are having are always highly engaging and have a strong networking impact, our communication between meetings and the outreach activities to other stakeholders in the field of Citizen Science and Education still have room for improvement. With the Citizen Science COST Action, the European Citizen Science Association (ECSA) and the new EU-Citizen.Science project, we now have at least three international players in Europe and, in addition, many countries have national Citizen Science hubs; connecting Citizen Science with the education sector is one of the main goals for most of them. With a growing number of key players, the risks of duplications, competition and fragmentation increases. To avoid this, we decided to join forces and use this workshop to explore the needs of the community and develop a vision that would feed into the development of the new platform EU-Citizen.Science as well as a concrete communication strategy to collaborate and reach out to further stakeholders until the platform is established. We were very fortunate to attract participants from nine different countries and various different backgrounds representing, for example, teachers, educators, scientists, Citizen Science researchers, national hubs, the Citizen Science COST Action, the European Citizen Science Association and EU-Citizen.Science. To bring everyone up to speed with the latest developments, Tim Woods gave a brief introduction into the concept of and next steps for EU-Citizen.Science. Which channels does this community use to communicate? What do people within these communities gain from participating/contributing? We shared, clustered and discussed our ideas and over time developed a more and more coherent vision of how a platform could be used by the community at the intersection of Citizen Science and Education. For the second part of the session, we shared profiles of potential platform users. We used the Personas and Pathways approach taken from the Mozilla Open Leadership Training Series, to better understand who may be part of the community and what potential pathways from discovery to leadership might look like for each persona. Task 2: Go to Mozilla Open leadership - Personas & Pathways and read through the guidance on how to create personas and pathways. Drawing on your own experience in the fields of Citizen Science and/or Education, please develop a persona based on your viewpoint, expertise, role and experience and a pathway to participate in the community for this persona. 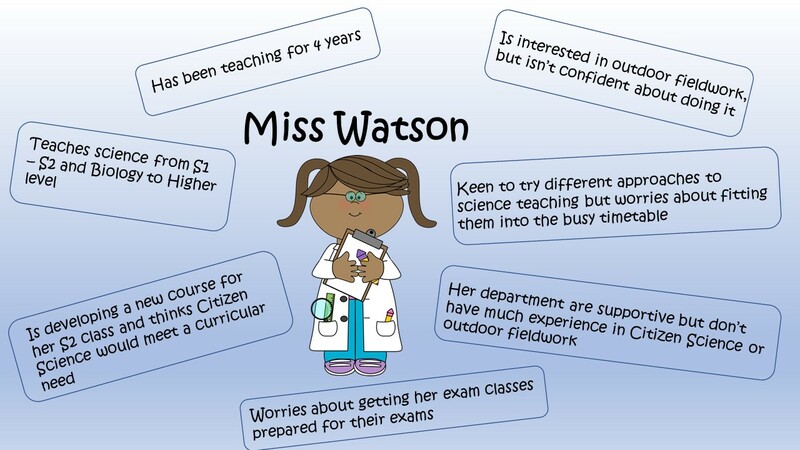 Miss Watson is an example of a teacher persona, developed by Claire Ramjan. She typifies a teacher who is interested in using Citizen Science with her science class but faces some challenges getting started. We hope that the information and ideas developed and collected during the workshop will provide the beginning of a dialogue with EU-Citizen.Science about how to take forward a community network to more effectively connect those involved and those who would like to be involved in Citizen Science. The document summarising the results of this session was shared with Tim to feed into the discussions at the meeting of COST Action WG4 and EU-Citizen.Science mid-April. As the EU-Citizen.Science platform will be developed over the next 3 years but is not available at the moment, we needed to come up with an communication strategy for the meantime. This way also allows us to prototype and test certain ideas before they embedding them into the platform. We carefully examined the developed personas to identify our core audience - educators, scientists/ researchers and Citizen Science professionals - and prioritised the ideas from our vision that we found urgent and realistic for us to realise ourselves. We scoped available platforms, applications, and software as well as skills and experience within our group to pool efforts and resources. 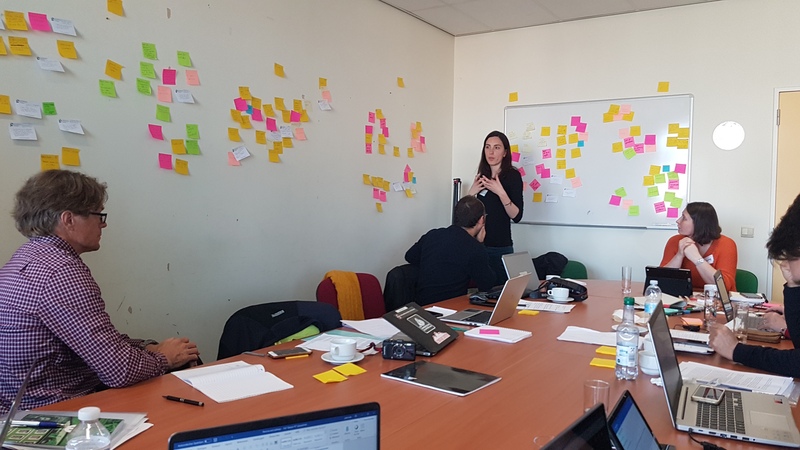 To avoid fragmented resources and communities and provide easy access to information, we decided to combine the efforts of the COST Action WG2 with the ECSA working group for Education and Learning. As a first step, a Google Site website will be created using a generic account with editing rights for chairs of both groups. In addition, we agreed on a concrete action plan to structure the development of a joint knowledge & collaboration website and the implementation of regular modes of communication within this specific group of the Citizen Science community as well as approaches to reach out to potential new members and relevant stakeholders. The launch of the website is planned for early May. We’ll keep you posted.